IGNORING the intense comedy centered around “The Khoj” and soon to be released Bangla r “King Kong,” the film industry of Dhaliwood is very nonexistent. While natoks and the sort have definitely taken a much better turn, we are still a very naïve nation in terms of producing anything outside of our typical Bangla cinema “jeyonashathi” and “tuiamar baba kekhunkorechish, toke amicharbona” movies. Likewise, the underground scenario of film can be termed as drudgingly nascent where we have low budget albeit motivating productions like “Finding Bangladesh” (www.findingbangladeh.com) and short films like “Bloodcase” and the sort. Latest additions to this genre of short films include “Before Sunrise,” produced by BRAC University Film Club (BUFC), which was premiered just this Sunday, and another upcoming title “Dreams,” produced by Pothochari Films (previously Scratch Films, the team responsible for Finding Bangladesh). After six years of operation, organising various film shows at the university, orphanages and other appropriate venues, BUFC finally went head on to produce its very first short film. 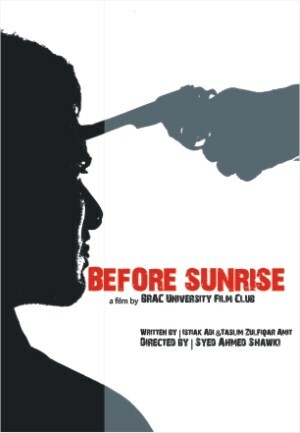 Celebrating its 6th birthday with its 3rd annual film festival, the club premiered “Before Sunrise” at the indoor games room of Brac University (BU) with its VC, Dr. Ainun Nishat as the chief guest and Tanim Noor (director of Phire Esho Behula) of Shristigorh as the special guest. It is probably apt to mention here that till recently, the censor board of our country did not approve of any so called digital films. All airs at stations and theatres had to be on film reels. It was a movement by Tanim Noor coupled with other advocates of digital films who finally managed to somewhat lift this idiotic system just a few months ago or at least convince the censor board that digital films are not evil. Moving on. The concept behind “Before Sunrise” took birth during a typical adda session at a renowned road side tea stall just outside of BU. It's kind of like the pondering session we have while in a loo… except in this case it's a 'tong'. Directed by Syed Ahmed Shawki, with a team of 17, 3 days of shooting and 2 weeks of editing with intense use of BU's media lab, the 15 min short film follows a life that gets hit by downturns one after another and eventually seeks refuse in a lifestyle one often does not turn towards. With 10,000 taka budget (satisfaction of the tummy included), one month production period and as a first attempt in visual storytelling, the concept was well prepared and cinematography was decently carried out as much as it can be with a Sony Handycam, resources being the main restriction of any indie film maker. Oh did I mention that there was blood involved? Tomato ketchup or red paint? I honestly have no idea but it was darn well carried off. Regardless, we hope to see many more productions from BUFC, each better than the last! Premiere of “Before Sunrise” was followed by a pre-premiere showing of “Dreams” which is aimed to be released early or mid-August. Directed by Adnan M. S. Fakir, the short film builds on the notion that dreams often tell of one's sentiments more elaborately than words can phrase. It tells the tale of a misfortune, its embodiment and its remedy, of a mind that is enclosed by society's foul stench and released by its beauty. Utilising sand drawings and poetry, it's a short film best to watch and judge for yourself. The film festival at BRAC University showed films of prominent directors such as Steven Spielberg, Aparna Sen, Mira Nair, Quentin Tarantino and continued throughout the week. People interested in watching some good alternative films made by resident directors can take a look at 'Priotomeshu' by Morshedul Islam, 'Dubsatar' by Nurul Alam Atique, 'Kanna' by Maruf Hossain and 'Deshantori' by Mridul Chowdhury. The rising interest in film as a visual medium in the underground level is certainly very expectant. Let's hope that in due time the common perception of “The Khoj” being a blockbuster of Dhaliwood is lifted with something better. WHEN you turn on your PC to use the Internet, the white and empty looking page of Google is sure to come blobbing up in a corner of your mind. Google has successfully made their site the front door through which everyone passes in order to access the Internet, but the web is actually bogged down by a wide range of search engines that cater to wide groups of enthusiasts who prefer them over the boring white. IMDb - The Internet Movie Database is truly a mammoth depository of movie information from where you can search your heart out for the long-lost movie that you still long for. One of the best parts of it is that using IDMb, you can even search for the plot of movies and amazingly, even the soundtracks; even though I could not master the last technique as my terrible vocal chording found a soundtrack named "ghrrr" instead of the "die hard" track that it was supposed to find! They even have a virtual university where you can take classes and learn to search through this monstrous engine, something that I would seriously suggest. Other good "alternative" video search engines also include blinkx and video.aol. ChaCha - Basically a mobile search site that also offers other services, ChaCha is like having a smart friend you can call or text for answers on your cell phone anytime for free! 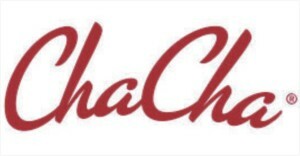 ChaCha works with virtually every provider and allows people with any mobile phone device - from basic flip phones to advanced smart phones - to ask any question in conversational English and receive an accurate answer as a text message in just a few minutes. Even if you cannot manage to make it work with your provider, the pc site is a great help too. It has an amazingly phony artificial intelligence (I must admit) and is in no way related to your uncle! Wolframalpha - Even though many think that it is a math based site, this computational knowledge engine actually provides solutions to many questions using math as it was made with data from Mathemetica. Voted the greatest computer innovation of 2009, Wolfram Alpha is an answer engine developed by Wolfram Research. Its online service answers factual queries directly by computing the answer from structured data, rather than providing a list of documents or web pages that might contain the answer as a search engine would. It is a fun site for even those who do not want to search, giving them a great interface that can calculate almost anything. In fact, there are many people who throng this site to play with numbers and dates. Also, it is fun to see live weather information from different Dhaka stations on the site (it showed the weather as rainy last Friday noon when it was literally crow-cracking sunny!). Tagjag - This site is a good way to shop for products on Amazon, eBay, and other popular online stores at the same time as it brings the results together for the users in a single search. Even though my search for chickens (yummy?) in this site brought me the option of buying chicken flavoured tear stain eliminator for dogs, I would still suggest this site for the mass as shopping at Google is just too clustered for an everyday person. Metasearchers - Operating on the premise that the Web is too large for any one search engine to index it all, metasearch engines provide a more comprehensive search result by combining the results from several search engines and presenting them in a unique way. Recommendable ones include mamma, monstercrawler, 9meta, etools.ch, tripleme, etc. A Bangladeshi metasearcher that you could give a try is searchw3.net.bd, even though it failed to impress me. But then again, while trying out these sites, you must also consider the fact that to find all of these engines, I used ol' Google! WHEN was the last time you attended an extreme underground concert? You might have to rack your brains to remember if you did happen to witness any of it lately. Most of the past one decade was ruled by the Underground music scenario. The years of 2003-2009 could be taken as the golden era of Bangladesh Underground music. But where is it now? Vanished or still hibernating? There was a time when the UG floors were rocked by beasts such as Artcell, Vibe, Dethrow, DNA, Kral and Poison Green. The Fu Wang Club and the Russian Cultural Centre were often found overloaded with hungry rock and metal crowds. Legacy of Metal Parts I and II, Concert Against Push Sell Parts III and IV, Reign of the Metal Gods, Rockers United, Legion of the Beasts, Masters of Insanity, and many more would just be a few of the many blockbusters from last year. Take this for example. The 6th of February, 2009 saw Legacy of Metal-I, featuring Artcell, Power Surge, Mechanix, Scarecrow, Funeral Anthem and Inanimate. Tickets from outlets had already been sold out. The road in front of The Russian Cultural Centre was flooded with people in Black uniforms. The organisers were unable to fit those people in the auditorium and unfortunately many had to return home. Legacy of Metal I was the biggest UG concert of last year, if not of the decade. On the contrary, the auditorium is almost half empty nowadays. And only two out of the very few gigs this year till now have been upto the mark. The first one with a mainstream lineup of Warfaze, Aurthohin, Black, Artcell, Lalon, Kral, Mechanix, Funeral Anthem and a few more. This was on the 26th of March, under the banner “Shadinotar Shurey Gaibo Mora”, at the Kalabagan Krira Chokro. Another was a Batch Community show on May 1st which featured Warfaze, Aurthohin, Cryptic Fate, Black, Power Surge, Mechanix, Shunno, Funeral Anthem and others. With the exception of these two concerts, all other gigs this year have received just half the response expected or you can say 25% if compared to last year. Out of these, the most embarrassing one would be the Batch Community Show a couple of weeks back on 9th July in BCCI. A band like Mechanix with an audience of around 50 and most shockingly, Power Surge, the headliners of the night performed in front of TEN odd people, whereas they have made a few hundreds bang their heads to the limit on numerous occasions! Where are the music lovers of Bangladesh? Where are the BD metalheads? These are just a few of the many questions pondering in the minds of hundreds of people. What are the organisers and sponsors doing about it? Here are a few things, which might just be the answer to all these questions. Firstly organisers(not all) have been bagging the money that the sponsors give them to arrange a mayhem with the result that the proper advertising of any upcoming shows taking a backseat. While to many this may sound as a blatant exaggeration, this in fact is a claim supported by some of the most prominent faces of the underground scene. Then comes the increased rent rate of RCC, if this venue is not hosting a gig, a healthy number of people would not even bother to attend a concert in any other venue. This problem would also not rise if there were proper venues for concerts. The highly priced tickets and the increased rate of push sell business to raise profits could add some more to it. And where on Earth is D ROCKSTARS? This was never a lost project. Neither did it lack venues or finance. This was the perfect platform to bring out the talent from corners of the country. A lot of talented bands could be renowned if this event was to take place. Rather, their talents are being wasted in dimly lit rooms of buildings around the country. Are the big UG names like Power Surge, Mechanix, Severe Dementia, Kral, Funeral Anthem, Mirror Blaze, Inanimate and others sleeping? They should take a move to resolve this problem. A few days back an interview with www.radiocirclebd.com included renowned UG faces who were talking of resolving this crisis which might open fresh air to this suffocating scenario. The lost glory must be revived. This problem has to be resolved because if left alone it can become the reason for the declination of rock and metal music in Bangladesh and tonnes of immensely talented bands, artists and musicians who would have risen by climbing the steps of the underground. References: Research and interviews held with underground bands.